The process of collecting information from sales data and market trends to determine future targets and estimate future sales performance. Gaining visibility into your channel sales activity is essential for understanding the speed and flow of your product in order to control inventory level while fulfilling demands. Sales data not only grants businesses the ability to analyze data trends in real-time but also provide the crucial information used in the supply chain industry for short-term forecasting. Channel incentives tend to have the most evident effect on motivating partners. By providing channel partners the tools for sharing inventory and point of sale (POS) data, vendors can automate and accelerate their partners’ incentive payouts. As a result, the administrative time associated with an incentive claim processing is reduced which ultimately results in more satisfied partners. Vendors who provide their partners and sales reps with regular earnings and real-time compensation reports have witnessed an increase in efficiency and partner motivation. 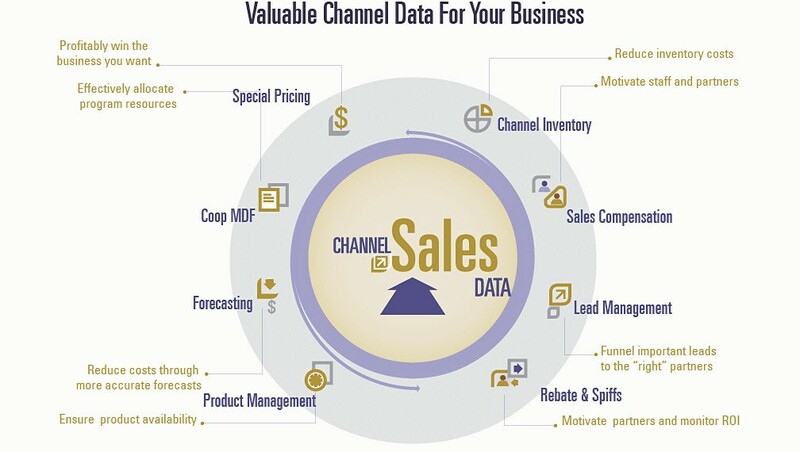 Lead management is amongst many of the benefits channel sales data provide vendors and their partners. Historical sales data allows vendors to create a more effective sales strategy and provide opportunities for a more efficient and improved customer acquisition process. In addition, analyzing conversions allows for sales teams or partners to revise and/or improve their tactics in order to better their customer retention and experience. By studying lead conversion rates, channel sales managers are able to funnel their leads to partners or sales reps that have demonstrated successful results. SPIFs are financial incentives that encourage salespeople to push the purchase of a specific product. Vendors utilize SPIFs as a motivational sales strategy with their respective channel partners, who in return, receive monetary bonuses for a (desired) completed transaction(s). However, as effective as they are in promoting a certain product, SPIFs can be a nightmare for a vendor’s administrative staff. Based on the SPIF’s program intricacy and system of validation, the payouts are not always as scheduled. By analyzing sales data, vendors are able to integrate and measure sales revenue/transaction reports so they can accurately compensate channel partners. Access to real-time sales data has enabled vendors to recognize sales achievements faster and deliver rewards at a quicker rate. Product managers play a big role in ensuring the overall market success of a product. Assessing the market demand for a product requires extensive research for understanding both the target audience and the value the product sets on solving a particular issue. To define a road-map for bringing a product to the market, product managers take into consideration a list of data-driven factors. Studying and understanding sales data is on top of this list. By leveraging current and past sales data – such as active users, acquisition cost, and average revenue, product managers can more accurately predict the success and availability of a product. In order to maximize sales and revenue, management relies on the information supported by accurate sales forecasting. A data-driven forecasting means studying and detecting all possible risks or opportunities in the sales pipeline. At the same time, analyzing sales data provides management the opportunity to detect early warning signals and risks in the sales pipeline. The early detection prepares management with a chance to address issues before they affect the organization’s productivity. As a result, vendors might decide to allocate more appropriate Co-op/MDF marketing funds to these partners or choose to adjust how their Co-op marketing funds can be used to attract more qualified leads. For a company to stay profitable in the competitive channel marketplace, special pricing programs provide a window of opportunity for winning more deals. By relying on sales data, channel managers can give manufacturers a better handle on when to award special pricing. The sales data helps channel managers determine how deep a discount to offer, whether it makes sense to do a counter offer and other similar pricing issues.